Do you know which nuts are the best on keto? Nuts are a super convenient snack option and since most of them contain more healthy fat than carbs, they’re ideal on a ketogenic diet. But not all nuts are keto nuts. While fat-bottomed macadamia nuts trump all others and help you stay in ketosis, others have the potential to eat up half your carb budget for the day in a single mindless snack sesh. If you’re staying away from nuts, let’s begin with a few reasons why you’re making a big mistake (unless you have a nut allergy). Magnesium, an essential mineral both your body and brain need adequate amounts of in order to function right[*]. Selenium, an antioxidant that strengthens your immune system[*]. Manganese, which aids in fat and carb digestion and blood sugar regulation[*]. 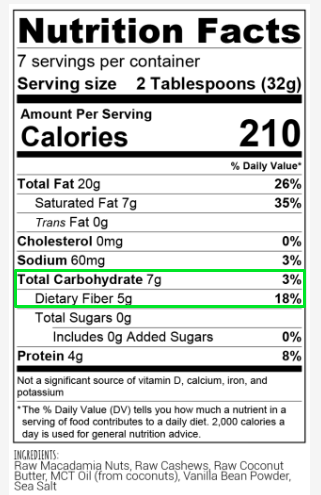 You can thank fiber for many nuts being low in net carbs (which you get when you subtract fiber from the total carb amount). Fiber also performs another role: blood sugar control. This means when you snack on a serving of keto-friendly nuts, you won’t see a blood sugar spike like you may with other snacks. Since these keto snacks are perfect for the on-the-go life, you can keep a small stash in your bag so you always have a keto-friendly snack wherever you go. Just remember: It’s an absolute must to get your portions right with nuts. Let’s say it again together: Nuts are only low carb if you practice portion control. Double the serving and you’ll go over your carb count in just one snacking. Repeat this mistake and you’ll jeopardize ketosis despite all your hard work elsewhere. And that’s not the only caveat with nuts you’ll need to consider. 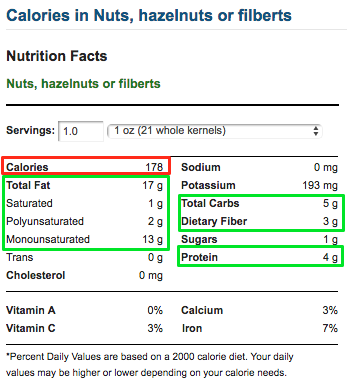 While most nuts do contain fiber to reduce their total carb count, some nuts are lower in carbs than others. 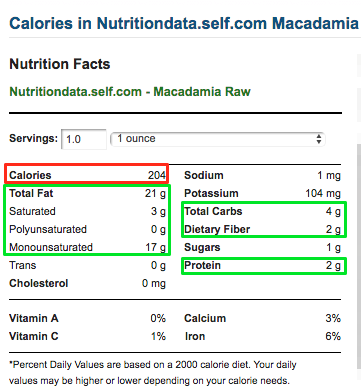 Why is macadamia the king of keto nuts? They also have just 2g of net carbs, so it’s no surprising they get all the glory when it comes to the best nuts on keto. 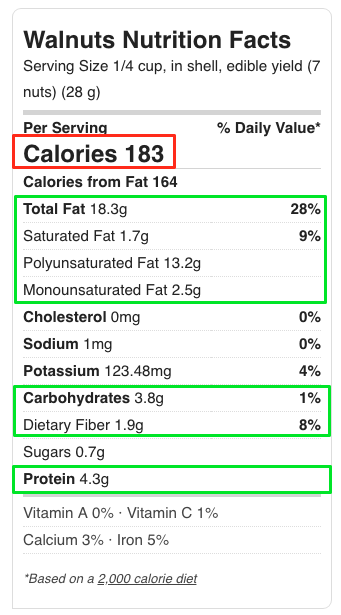 What makes that fat so special is the 17g of monounsaturated fats specifically. Monounsaturated fat is the kind that reduces insulin resistance and cholesterol levels while also preventing the accumulation belly fat and heart disease. Macadamia is the star of our Perfect Keto Nut Butter, a keto-friendly blend that includes cashews, coconut butter, MCT oil, and vanilla bean powder to boost your ketone levels and satisfy your keto cravings. Pecans have a completely different flavor and shape than macadamias — but their macro profile isn’t so different. If you’re only familiar with this nut in sweets like pecan pie or sweet potato casserole, you need to give the buttery pecan a double take. 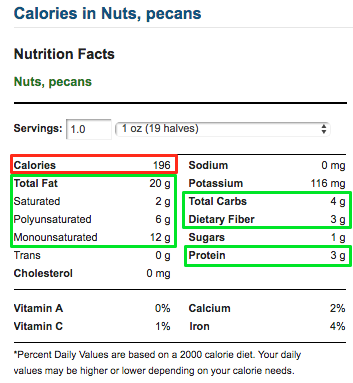 That’s right, pecans are over 70% fat. Pecans contain a high amount of oleic acid, which has been shown to reduce your risks for cardiovascular disease and type 2 diabetes, while also improving your immune system and lowering inflammation[*]. The next keto-friendly nut on the list is also a member of the one-net-carb club. Brazil nuts are pretty easy to spot because they’re so massive. And since Brazil nuts are so huge, you don’t have to eat a ton of them. 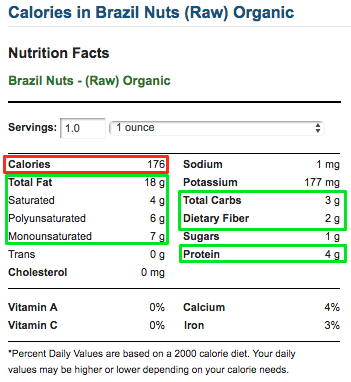 A single ounce serving is about eight Brazil nuts, which fits nicely in a small container. In one study, researchers learned a single serving of Brazil nuts may have helped lower serum lipid levels such as cholesterol and triglycerides[*] in their participants[*]. While more research is needed to prove this further, this isn’t the only health benefit Brazil nuts have up their sleeve. Brazil nuts also contain high levels of selenium, which helps improve cognitive function in older adults[*] and combats oxidative stress[*]. Walnuts are one of the richest plant sources of omega 3s. Polyunsaturated fats, which contain essential omega-6 and omega-3 fatty acids, are also found in avocados and sunflower seeds. Walnuts are also a no-brainer if you’re trying to lose weight. During one trial with 293 study participants, those who consumed 30g of walnuts per day (just over the 1 oz. serving) showed the biggest weight loss improvements over a three month period[*]. What’s even more interesting is the walnut-eating group also made better food choices and avoided poor nutritional options. Researchers are also heavily using walnuts in cancer studies and have noticed positive results so fa[*]. In animal research, scientists found walnuts reduced and prevented breast and prostate cancer growths in mice[*]. As for human studies, scientists say antioxidant levels are higher in those who eat walnuts, which can help prevent DNA damage and cancer from developing[*]. Be honest: Is the only reason you even know about hazelnuts due to one famous chocolate and hazelnut butter spread that shall remain nameless? It’s okay; you don’t have to answer that question. And this fat may lower your chance of coronary heart disease[*]. One systematic review and meta-analysis spanning 385 scientific papers shows a diet rich in hazelnuts can help lower total cholesterol levels without affecting HDL levels (aka, the “good” cholesterol)[*]. This one trait may lead to improved cardiovascular health. So while these five nuts have shown why they’re the best to eat on a keto diet, they aren’t the only ones you can snack on. These next four nuts have a slightly higher carb count, but that doesn’t mean you should ignore them. What happens if you’re not crazy about those five best keto nuts? Or if you’re tired of eating only macadamia nuts? Pine nuts, or pignolias as they’re sometimes called, straddle the border between keto nuts and nuts you should only indulge in every so often. So while 3g of carbs may seem miniscule in the grand scheme of things — especially since the other previous nuts had one or two net carbs — this snack will account for over 10% of your carb macro if you’re sticking to 25g of net carbs per day. Almonds also share a few of the perks pine nuts boast, especially when it comes to their monounsaturated fat. Just like hazelnuts, almonds clock in more monounsaturated fat than any other nuts on the list at 9g per serving, or about 23 almonds[*]. 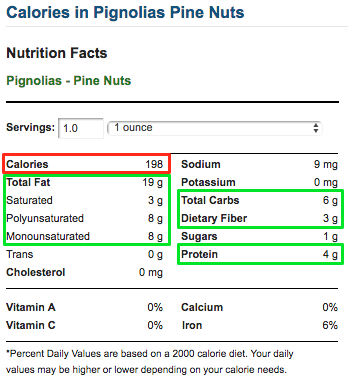 Now, before you shy away from almonds due to the 6g of total carbs, understand that with 4g of fiber, that’s only 2g of net carbs, making them safe on keto as long as you use portion control. You can also capture these benefits by using almond flour, which is the perfect low carb alternative to processed white flour, and can be used in over a dozen keto recipes. The next semi-keto nut can be tricky, but you won’t have any problem if you eat it the right way. 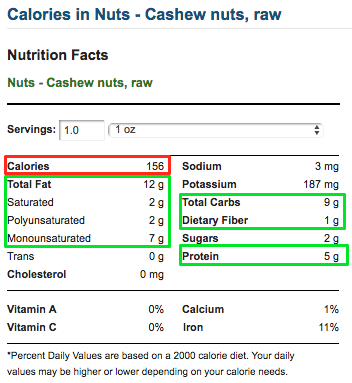 For a nut many outside the keto world consider “too fatty”, a serving of cashews only has 12g of total fat, which is lower than all five of our fave keto nuts. 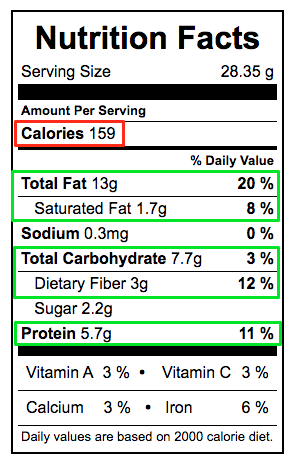 And here’s the tricky part: that fat comes at a cost of almost 8g of net carbs. Good news is, you don’t have to completely give up on this tasty snack. One efficient way to get your cashew fix without all those carbs is to find a nut butter blend of high fat, low carb nuts (like macadamia) and cashews, like our Perfect Keto Nut Butter. This keto-friendly butter helps you cut the carbs — from 8g to just 2g — and keeps your daily nut fix or afternoon snack interesting. The final nut to consider on keto is pistachios. While they have slightly less fat than the other nuts in this category, pistachios also have one of the higher protein amounts. Studies have shown an increased intake of pistachios may lower blood lipid profiles, which can improve heart health[*]. Just keep in mind this research was quick to point out this positive benefit only happened when the right amount of pistachios was consumed. This means you can’t go overboard with these nuts just to reap the health benefits. In addition to unwanted weight gain, you may also unknowingly kick yourself out of ketosis (or delay your body from ever getting there) due to the carbs. 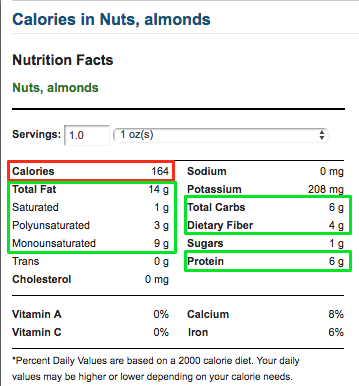 The protein in these nuts are not a problem because protein doesn’t put you out of ketosis. Speaking of that, another feature pistachios share with other nuts on this list (with the exception of hazel and Brazil nuts) is that you can purchase them with their shell still on. Some researchers have pointed out the process of having to de-shell nuts before you eat them slows down how much you consume[*]. They also learned that when study participants were able to view the empty shells of all the pistachios they consumed, they ate 35% fewer nuts. So now as you eat your pistachios, keep that mound of shells in view instead of tossing them in the garbage and you may unconsciously self-regulate your snacking. Okay, so you’ve met all the nuts you’re compatible with as a ketoer. Rather than double booking dates with all of them right now, you’ll want to learn how to pick the right nuts over the potential nightmares. These include preservatives, sugar, added flavorings and crappy oils used for roasting (such as soybean, canola, sunflower and other veggie oils). These will not only cause inflammation and wreak havoc in your system, they’ll cancel out any of the positive health benefits you may think you’re getting. While roasted and salted options may add more electrolytes to your day, you can always do this process yourself with dry nuts to control the quality of the ingredients you put in your body. In case this wasn’t stressed enough, you must be aware of serving sizes when it comes to nuts. It’s best to weigh out your portions instead of eyeballing them or even counting nuts because each serving varies in how many you can safely enjoy per one ounce. Even though nuts are one of the healthiest foods you can snack on, many people unknowingly overdo it and end up blowing their carb macro without realizing it. Don’t make that mistake, or these 3 others either. Because if you do, you’ll risk flushing your ketosis dreams down the toilet — and possibly gaining weight instead of losing it. Rotate your nuts and you’ll treat your body to a buffet of nutrients. This tip is true for most vegetables, meats, and fruits, but it’s just as important with nuts on keto because, as you’ve seen today, each nut brings different nutrients and health wins to the table. So instead of only sticking to those with the most fat and fewest carbs, try to graze a bit from all nine nuts on this list and you’ll never get bored. You can also avoid boredom by making different keto treats with keto-friendly nut butter, like smoothies, butter cups, mousses, bars, and cookies. This tip will also keep you from creating imbalances in your body’s nutrient levels, which you’ll want to pay attention to. Some people have a hard time digesting nuts thanks to what’s known as anti-nutrients like phytic acid found in them. If you’re sensitive to these, you may experience digestive problems after eating nuts and your body may not absorb nutrients and minerals such as calcium, iron and zinc. This doesn’t mean you can’t eat nuts ever again. It just means you should opt for roasted varieties or nuts that have been soaked or sprouted instead of those that are raw. Soaking or sprouting nuts helps break down the phytic acid in the nuts and makes them more digestible. So experiment with those keto nuts and the four semi-keto nuts you can sprinkle in your diet like nut confetti. And if nut butter is more your jam, Perfect Keto Nut Butter combines all-stars like macadamia and cashew with coconut butter and MCT oil for the ultimate nut upgrade that helps put you and keep you in ketosis. As long as you stick to the rules in this guide and don’t overeat them, nuts are a fast, convenient way to boost your overall health and stay in ketosis the smart way. 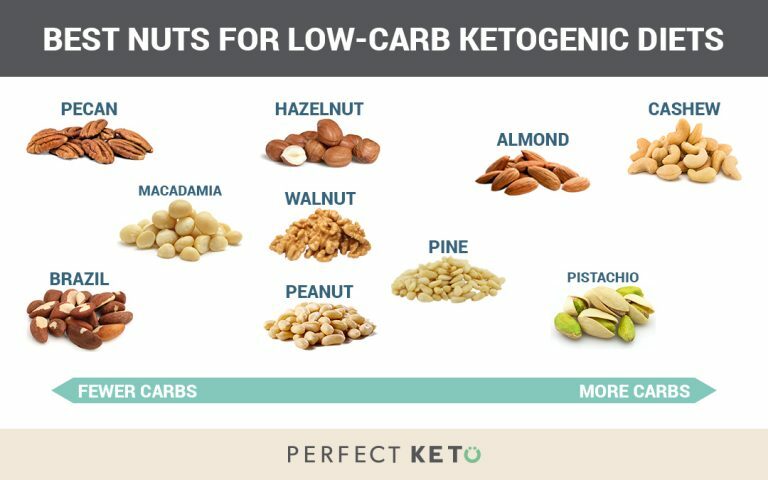 The post Best Keto Nuts: The Ultimate Guide to High Fat & Low Carb Options appeared first on Perfect Keto Exogenous Ketones.